There's no place like Amazon, am I right? 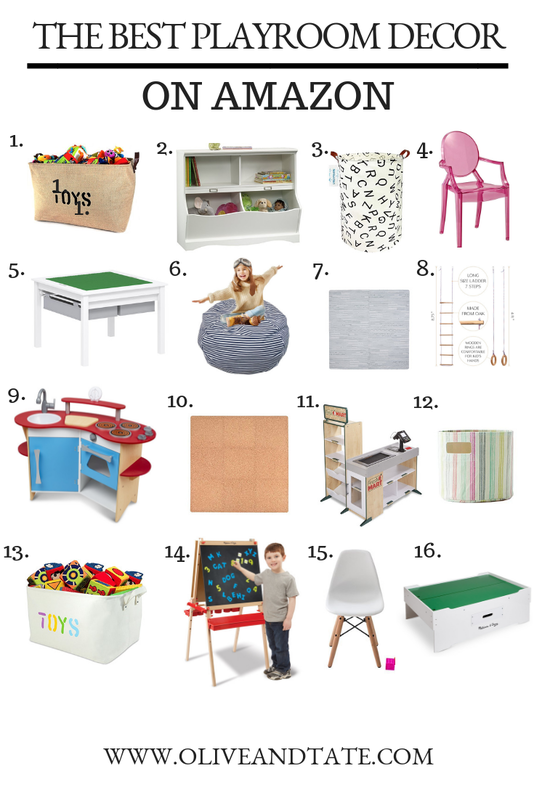 Nothing makes my heart happier than Prime shipping and a well priced decor piece, especially when it comes to the most important room in our house: our playroom. I've managed to put quite a few Amazon products to the test (and by "test" I mean "at the mercy of my offspring" and am happy to report back with some of my faves and a few that are on our upcoming holiday wish lists! We believe in open bins and baskets for the small odds and ends that make up the crap that my children love, so we always have deep baskets on hand. In fact, the large basket/open storage system has helped us to encourage our kids to clean their play space up - we tell them to grab a "clean up basket" of their choice and fill that baby up until the floor is clean. Something about the visual of filling the single basket makes the task seem less daunting for my 4 year old and I don't care how the cleaning happens as long as it happens! This particular bin made the list thanks to it's sturdy handles and burlap material - tough is better around my crew. 2. The dream storage chest. If you've been following my for awhile, it won't surprise you that this storage unit made the top of the list. We've owned one for four years, purchased a second two years ago and, despite their reasonable price point, all have survived multiple moves across state lines. We don't have a rhyme or reason as to how the toys make it into the chests, just as long as they make it off the floor. Tall bins are the best for medium and large sized stuffed animals, which keep showing up in my playroom, no matter how often I toss them out. The stuffies take up tons of space in the traditional storage units and toy boxes, so keeping them in tall storage baskets is the way to go. I love an acrylic chair and couldn't resist adding this pink, kid sized number to my list. It also comes in clear and let me just say this - nothing is easier to wipe down or hose off than acrylic. I'll just let you imagine what experiences have lead me to say that with confidence. A LEGO table is nothing new in the world of playroom furniture, but this version not only comes with storage drawers attached (a harder find than you might imagine) but the LEGO top flips over and becomes a regular table top. LEGOs are a nightmare to store so keeping them in their intended play space keeps them from under my feet (hopefully). Some genius parent came up with the idea of creating an empty cloth sack that becomes a bean bag style chair when you jam it full of stuffed animals. 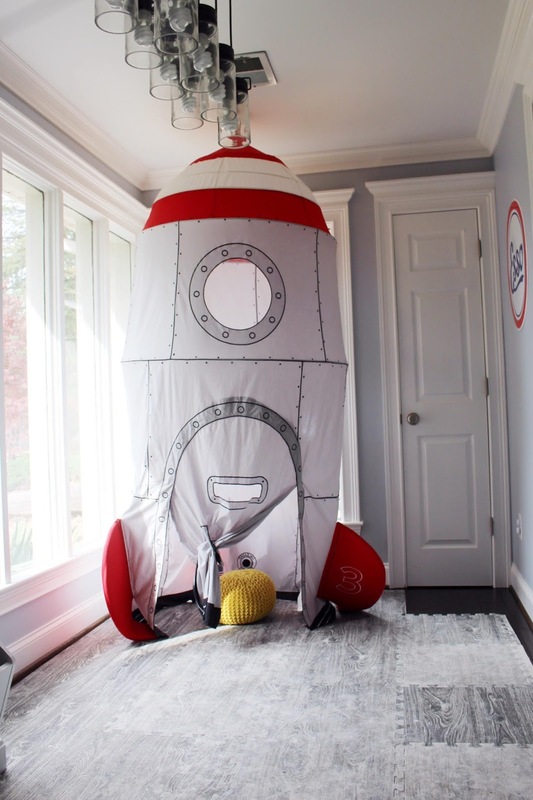 Another perfect solution for the cumbersome stuffed animals and this time it gives your kiddos a place to chill (this one is on our Holiday list!). We purchased this grey, faux wood toned play mat flooring to cover the hardwoods in one of our houses and loved it so much we just continued to buy to accommodate our various play spaces as we moved around. The tone of the play mat is a soft, neutral grey and it really does take the sting out of the traditional child care style foam flooring. I feel like my kids are already climbing the walls so why not give them the tools to really do it? In all seriousness, this indoor/outdoor play gym set is perfect to burn energy especially if you live in a long winter climate. I dig the retro vibe and basic color scheme of this play kitchen - and I hear its not a complete nightmare to put together, unlike another popular play kitchen that shall remain nameless (hint: it's this one). If the foam play mat doesn't float your boat, then maybe the cork version is more your speed. Either way, I can attest to the durability of the play mat and the happiness of the hardwoods underneath. If you have the space and find the traditional play kitchen passé consider the play store as your next Prime order. Bonus: you're teaching those kids how to run the grocery check out for you so one day you can kick back and read magazines while they handle the heavy lifting on the family grocery runs. I wasn't kidding when I said I believe in a ton of bins and baskets in a playroom. In all seriousness, this brand and version made my list because they come in two sizes that are small enough to fit in the storage chest upper shelves. We store baby doll accessories, matchbox cars and other small pieces in the tiny bins for safe keeping. This one makes the list because it's huge. And a neutral white, which I know some of you are dying for in a kid plays pace full of carnival colors. I understand and you're welcome. I love our easel because it provides long stretches of entertainment rarely seen around here. Here's a tip - if you happen to snag an easel that has a dry erase side, snag a paper roll and thread it through the gap between the top of the two boards, draping it over the side you don't want your kids to use (sorry, but we aren't using dry erase markers around here). If the acrylic chair wasn't your speed, maybe a mini version of a classic mid century mod chair will fit the bill. We have these chairs and love them, mostly because crayon rubs right off of the plastic with a swipe of a Magic Eraser. And finally, the classic coffee table sized train table, for the serious train hoarder. I do love that this table allows for a train set to be set up somewhere besides the floor, and that the track can be left in tact without providing a trip hazard for middle of the night bathroom runs. Bonus: it has tons of storage for pieces and parts!